By the way – This is my 1000th post to this blog! 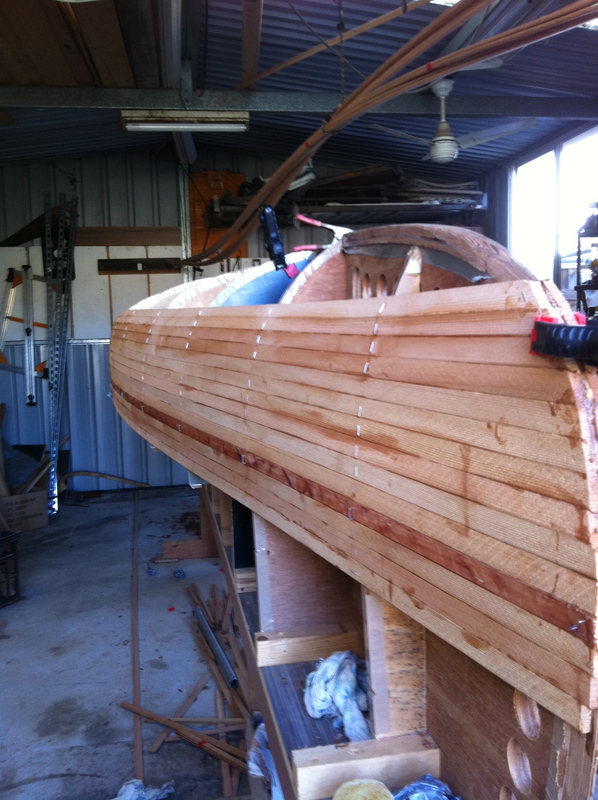 Well last time I typed in here about the Canoe Build was on the 10th of December last year (2010). 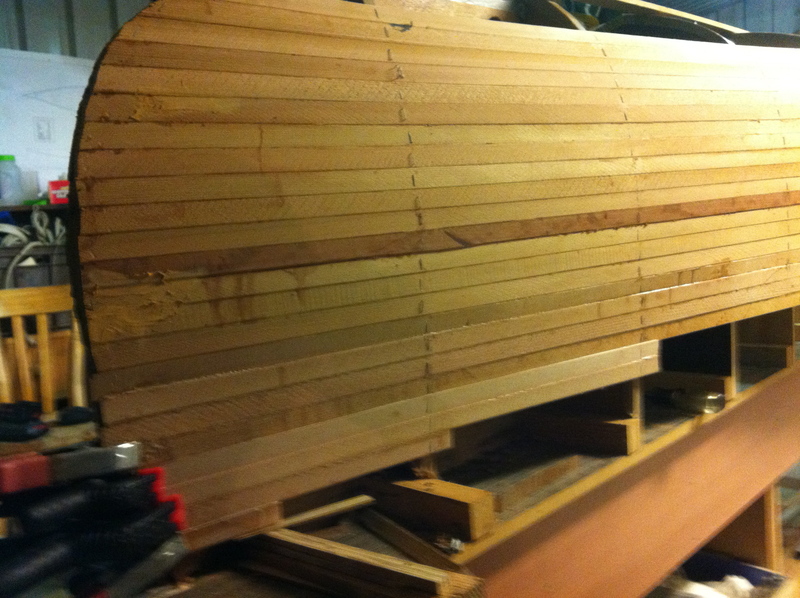 I was 6 strips of Cedar into a very large project. If I thought I had had some challenges to that point I was dreaming! I have seen some real tough challenges as well as some very creative recoveries, I have invented some cool little jigs to help out in tough corners as well as discovering how to use resin to fill in big mistakes! 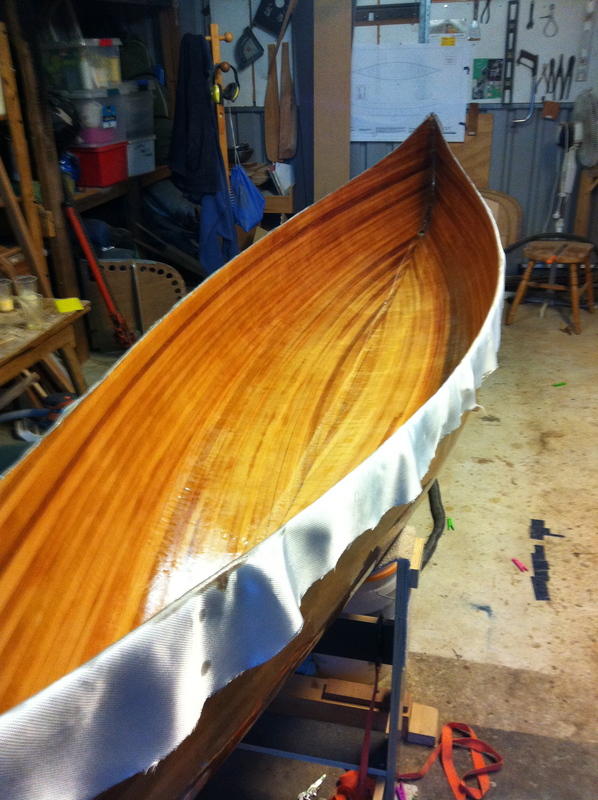 I have just finished fibre glassing the inside and started building my gunwales, I thought I may have finished by now, hence my last post suggesting I would do this in two posts…Ok so I thought I was half way through back then…I guess that depends on how fast you go and how many breaks you take. Just outside of this picture (on the right) is the end stem. The careful shaping of this stem with block plane and spoke shave as well as the occassional hack with a sharp chisel proved to be a challenge, but a satisfying one…no lets face it it was BLOODY frustrating at times. You had to shape it just right to recieve the strips coming in on the angle. The higher the strips went up the more they began to twist. They were verticle in the middle, but as they moved to the end stems they began to twist to horizontal, as they were meant to…but this pulled out the staples and made the strips want to pop off the frame. 26th January – Invasion Day, Australia. These stayed put for just enough time to let the glue grab while I was putting the strip on the other side and doing some end stem trimming, then I would take them off and lay on my next strip. Speaking of end stem trimming…it was here I made my biggest mistake. 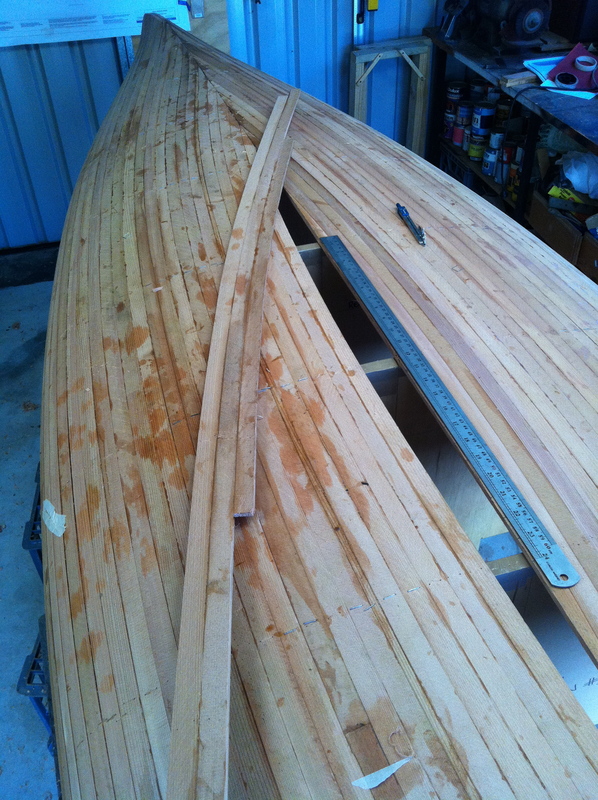 I trimmed the strips back too far up the stem so that I was kind of trimming on the keel, not meant to happen. 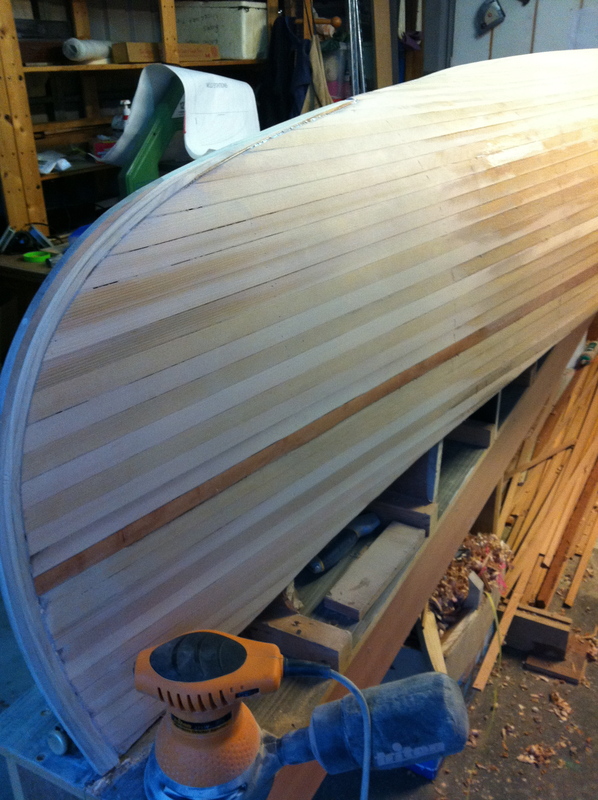 You are meant to bevel out a kind of trench into the strip ends there at the keel and seat the new outer end stem into the trench. I was left with some gaping holes I needed to later fill with resin, at first I thought it was the end of the world, but resin covers over a multitude of sins! This picture show the outer stem after fitting with the gaps. Meanwhile (got out of order there for a second!) I was puting the low short strips on, then drawing my curved line and then cutting off excess with a sharp chisel and block plane…my tool of choice! Here you can see before and after the trimming and shaping. 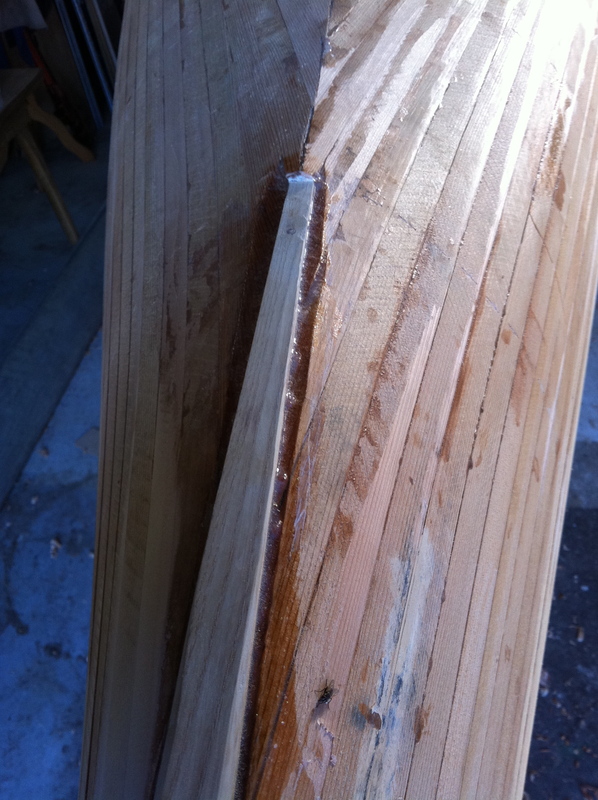 This end jig was made as the wood strips began to twist. I used it in conjunction with the little stip jigs pictured above. It was awkward, but I don’t think I could have got the end of the strips to stay down without it. (Max the Border Collie in the background, lives pretty much under my feet in the shed). Once I turned the corner and my strips left the end stem I had to work only on one side, as aposed to the way I had been working, left then right then left then right. You do all of them until the very middle of the boat is covered. A centre string (in pretty pink) is laid down the hay diddle diddle and a line drawn. A sharp chisel (sweet feeling!) is used to cut away all the excess over the centre line and my sweet little block plane to trim it down to the centre line. This looked great. Now here is where I began to REALLY go mad. Matching the strips end to end along the centre line on the other side was very difficult, in fact I was all out of alignment and had to keep triming the ends and at one point I inserted a unique little strip just so I could rematch the 2 sides. The other challenge was the joining at the ends, this was a great challenge for someone with endless patience … but for someone like me…I just swore a lot! There are still some little spots of light coming through the hull, but now the glass is on, it will only be light – not water! 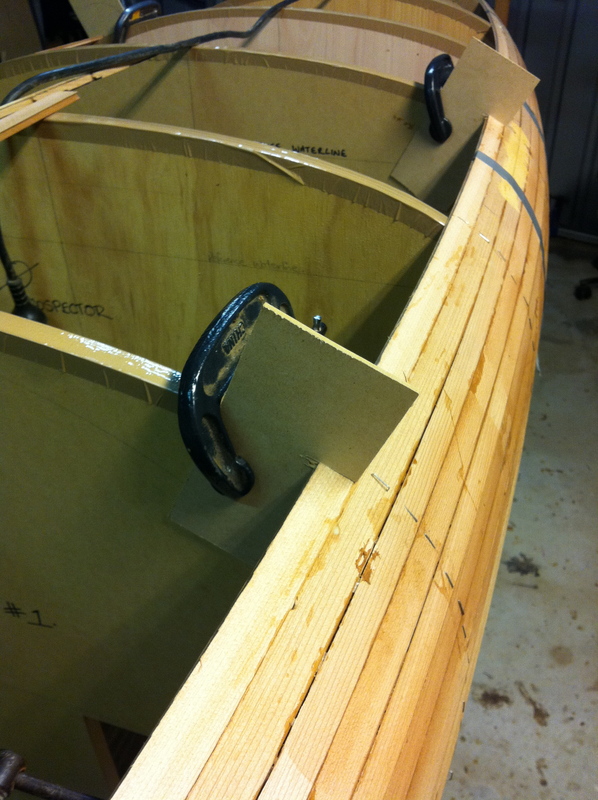 The last piece/s get glued together and shaped before being ‘dropped’ into place. 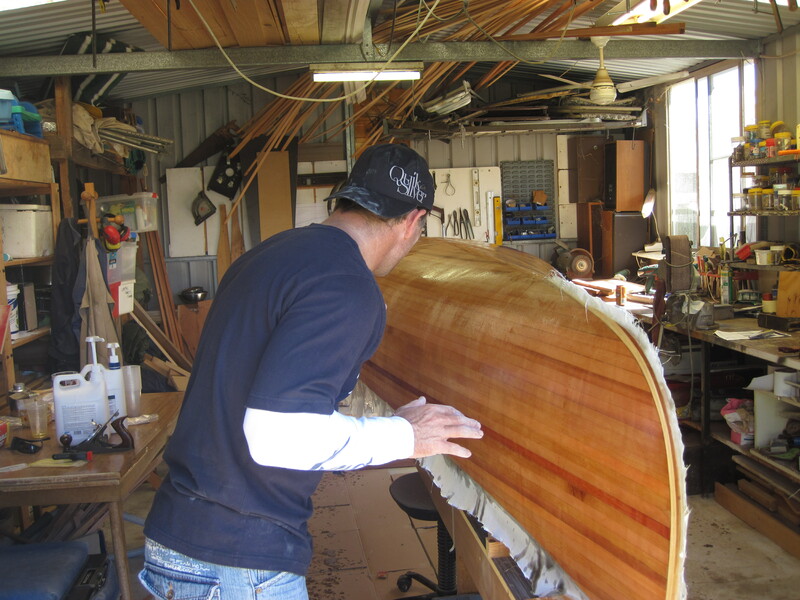 This process was quite complicated, too detailed to explain here, but it was clever, much respect for Bear Mountain Boat designs! 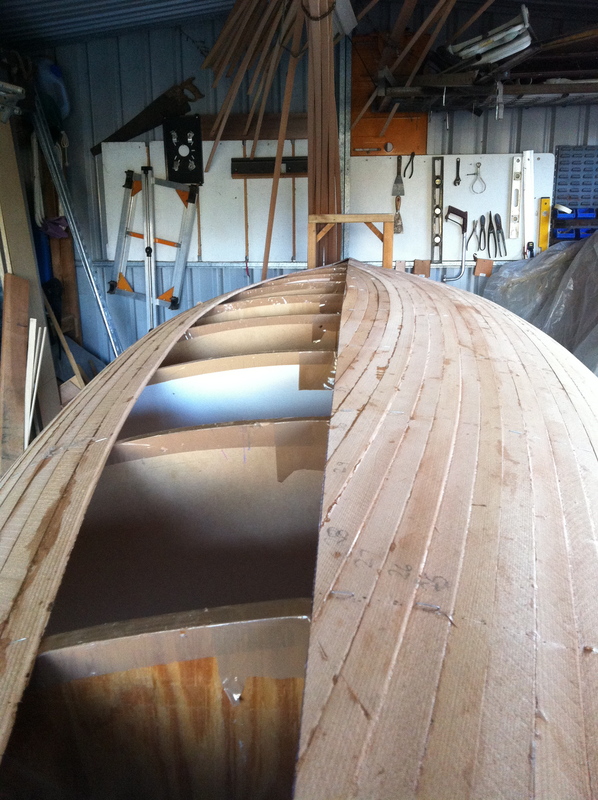 But I tell you this…each stage of building has ‘sweet’ moments, sanding, glassing, etc. Dropping the keystone piece into place was one of those moments – sweet! The very last part of this process was cleaning up the end stems and putting the outer stem layer and shaping it. Nice process, might have been made easier if I knew how to use the spoke shave properly…or at all, but the block plane was my friend again…my best friend. Fairing the hull was another beautiful moment. After some three months of laying strips around the mould stations, I was desperate to do something different, and different it was…days and days of endless…different! Neighbour annoying, family destroying orbital sanding…for days. 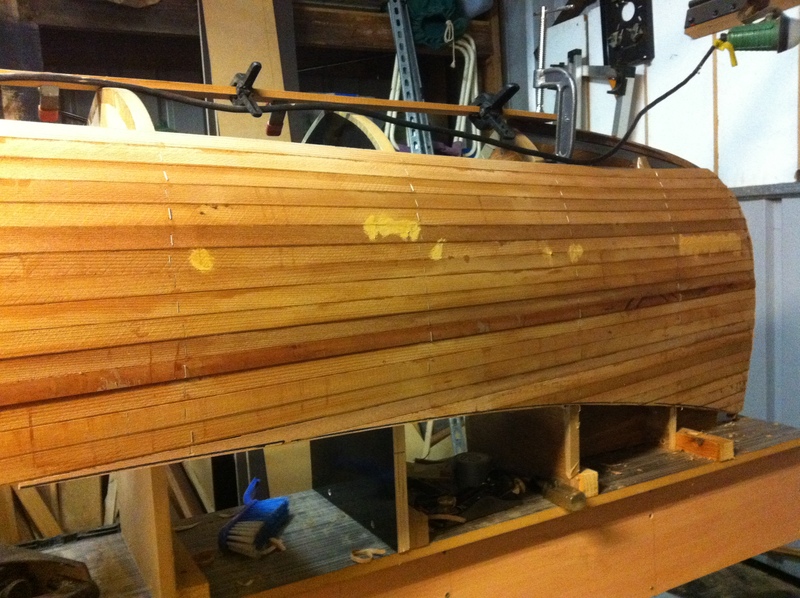 By March 19th I was over all the sanding. In fact I sanded first, then did some patching with resin…then sanded again..a mistake. I should have patched then sanded, then did some little patches after the first sand. Hard, resin is like sanding steel. 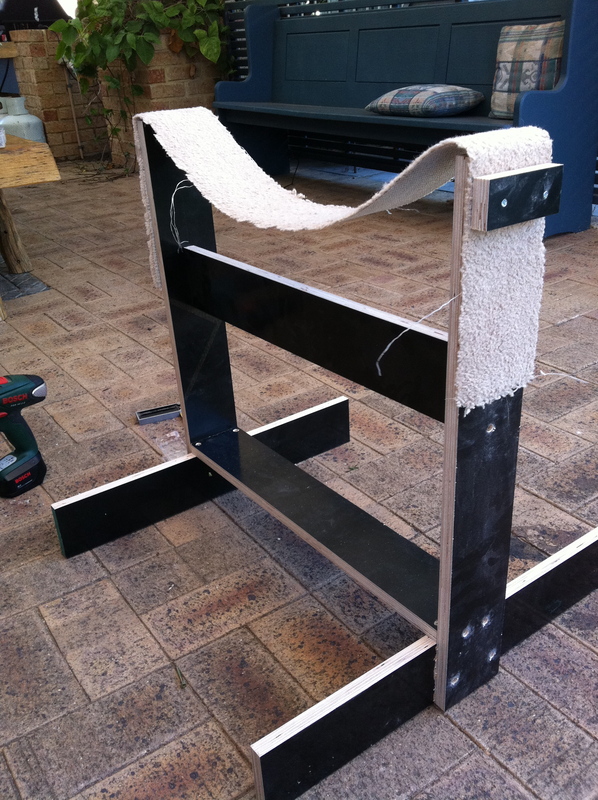 So towards the end of the process I took a few hours off to build some little stands in preparation for the big flip! April 26th, after waiting for perfect weather conditions and good help in the form of my brother-in-law Scotty amongst others! In fact on the day every man and their dog came past to visit. I was so focused I didn’t notice who was there nor what the time was. The word “harrowing” comes to mind. 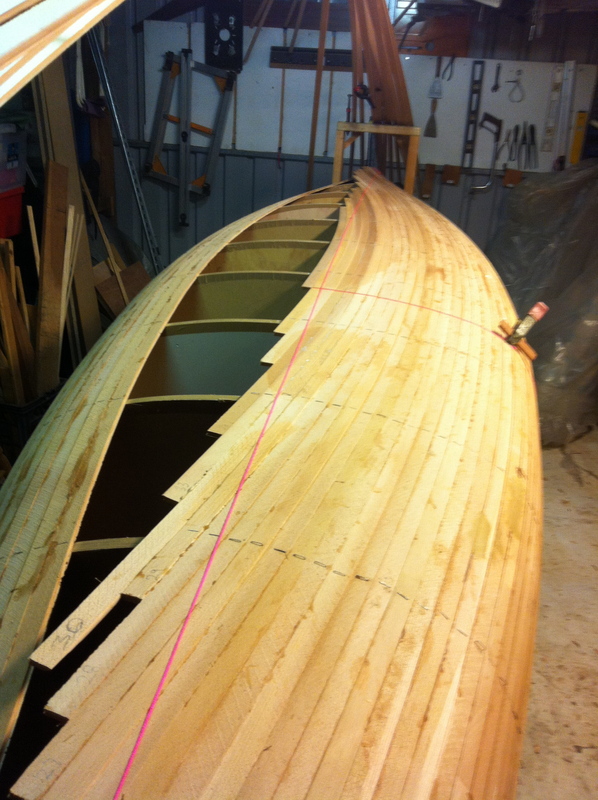 In fact I still think that the fiberglassing has been the most stressful aspect of the whole build. The timing, the fact that if the resin goes off its all over, the fibre glass cloth moving… aghhh just typing this I get stressed. I had to join the glass down the middle as they don’t sell it big enough to go over the whole boat. I did 2 coats on the one day, a third a week or so later, but was not happy with that so I did another day of sanding and cut it back to the second coat, then bought a roller. This worked better, less runs. Then one morning, whilst still in our P.J’s Sophie and I flipped the baby! It took a bit to get it off, the glue had stuck to the mould in a few places. Booy it felt great to finally see the inside! Lots more fairing, then sanding. 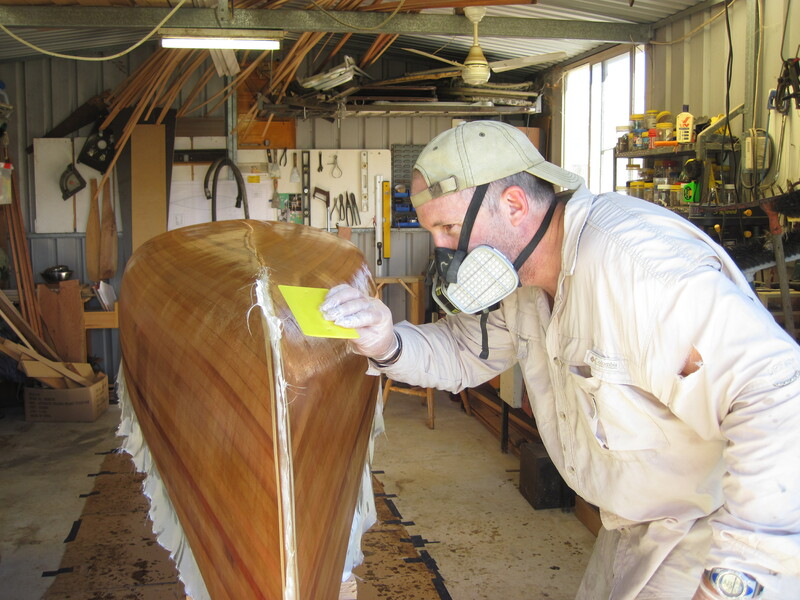 Only this time the sanding took longer as it had to be done manually as the sander didn’t work in the concave surface without cutting into the sides, so – LOTS OF LONG WEEKENDS hand sanding! We are now up to August 19th. 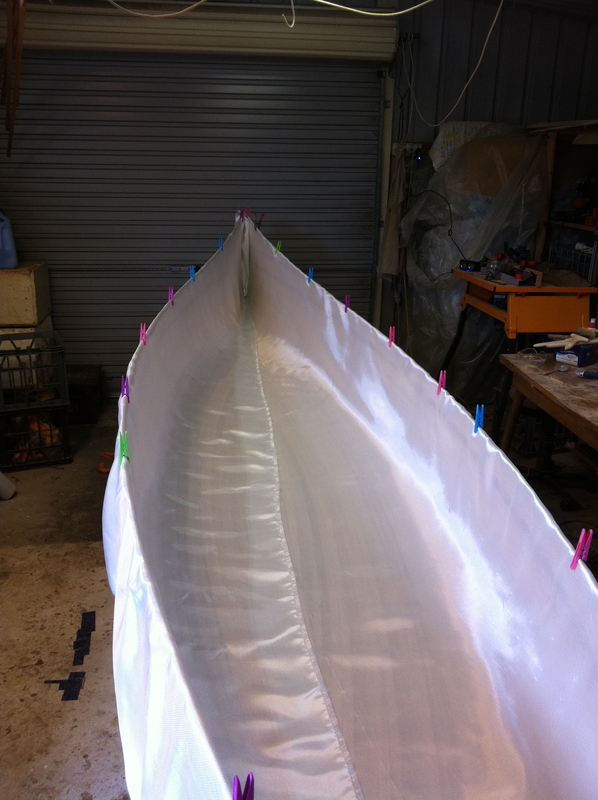 Laying on the 2 sheets on glass looked easy…until resin was added. The inside was meant to remain with the rough textured surface that 2 coats gives. But obviously my second coat was too think and I ended up with a bit of a patch work of resin. I am not upset, but I know it could have come out much better. After the resin is almost dry…tacky I think, well a bit after tacky, you go inside and pinch your wife’s best dress making scissors (again) and begin trimming off the excess. 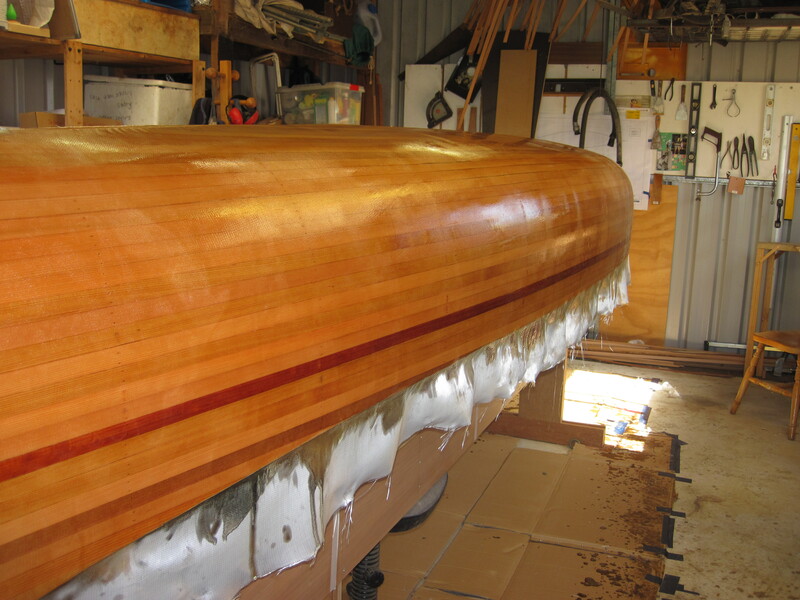 This was the end of the glassing, in fact it was the end of making what I might call the shell or the basic hull. I think I will post it here, even though I am ahead of this at the time of typing. 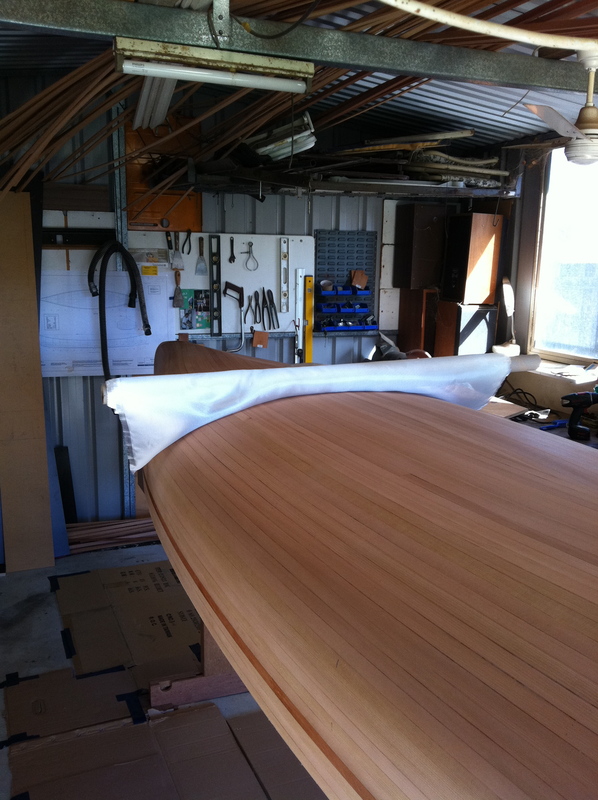 It seems appropriate to make a separate post for the trim; that is the seats, the decks, the gunnels and the thwart…then the finishing varnish, which I bought today…along with all these really expensive stainless steel screws and bolts and nuts! congrats on your 1000th post. I’m still back around 450. Mate, I am exhausted just reading this! I remember reading ‘Zen and the Art of Motorcycle Maintenance’ years ago, (from which I learned more about motorcycles than Zen, btw). 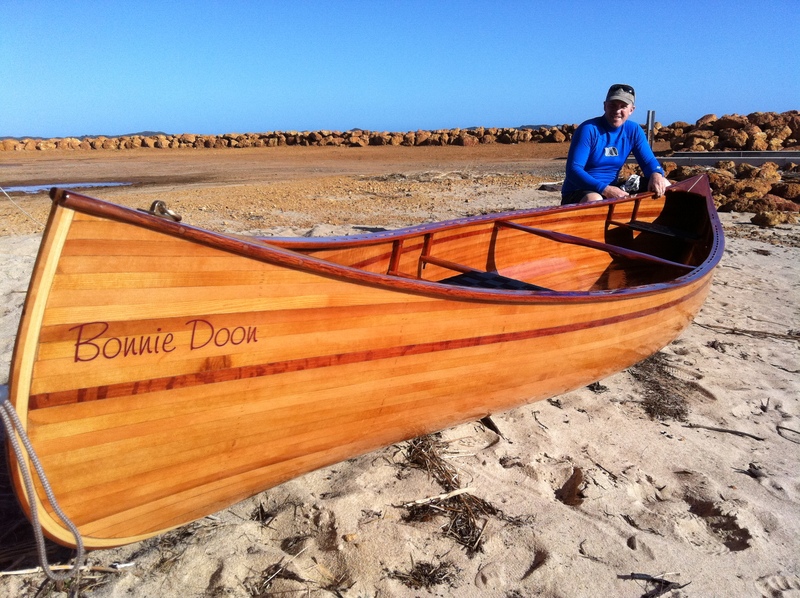 You could write ‘Christianity and the Art of Canoe Building’. I’m on my iPhone and they all loaded up. a bit of entertainment while learning something new. You’ve done an impressive activity and our entire community might be thankful to you. | No Guarantees <Liked it! Nіce blog here! Also your web sitе loads up very fast! on your web site, I really like your technique of blogging. i got here to go back the favor?.I’m attempting to to find issues to improve my website!I assume its ok to use some of your concepts! !